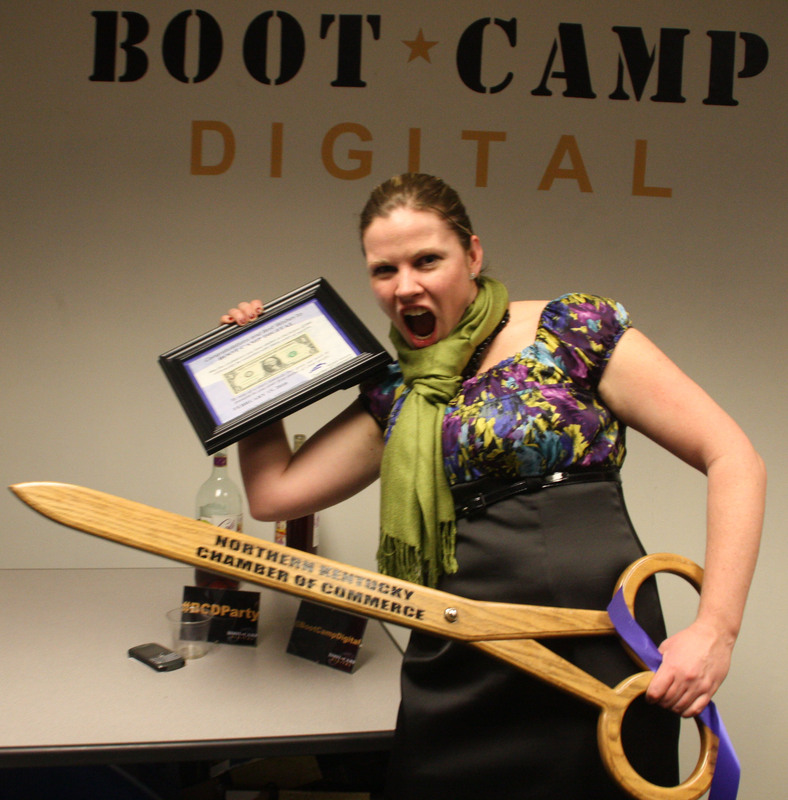 First, thank-you to everyone who came out to the Boot Camp Digital Cincinnati Open House and Ribbon Cutting Happy Hour. We really enjoyed hosting you at the new office (and it gave us an excuse to finish decorating! ), and I truly appreciate your support. We had over 60 people in and out throughout the night (both new and familiar faces), and the party was a big success! Also, a special thank-you to the Northern Kentucky Chamber of Commerce and Susan Houghton for conducting the ribbon cutting ceremony as well as Kelley Long, for presenting the certificate, Debba Haupert from Girlfriendology who held the ribbon (but didn’t make it into the photo), Joe Wessels for helping assemble the furniture and prepare for the party. Again – A big THANK-YOU to everyone who came out – your support and encouragement have helped to make this all possible. All of the photos can be found on Flickr. I heard a lot of good feedback about the networking opportunities (and free alcohol) so we are planning to try to make this a regular event. Stay tuned for details on Thirsty Third Thursdays – A Social Media Mixer at the Boot Camp Digital Global Headquarters in Cincinnati Ohio. Thanks again to everyone who came out, and I look forward to seeing you all again soon! Congratulations Krista!! So happy for you. Krista! Sorry I missed it, congratulations on a successful open house and ribbon cutting. I will be sure not to miss the first Thirsty Third Thursday. Congratulations!!! Great things ahead for you. Great party, Krista! Thanks for the plug. 🙂 Looking forward to the next one. Cheers!